The ISRO (Indian Space Research Organisation) said that they will be launching 28 international satellites which include satellites from Spain and the USA and the EMISAT in Sriharikota on April 1. 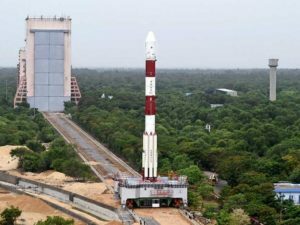 The EMISAT which weighs at 436 kilograms, it will be launched from the Satish Dhawan Space Centre which is located in Sriharikota, the space centre is located 100 kilometers away from Chennai. The ISRO said that on board the EMISAT is the PSLV (Polar Satellite Launch Vehicle) C-45. The ISRO said that the launch for the satellites will be subject to the weather condition on April 1. Originally, the launch was supposed to happen on March 21, but it was changed to April one by the ISRO. The EMISAT is based on the Indian Mini Satellite-2 bus platform. The main purpose of the satellite is to measure the electromagnetic spectrum. Officials from the Indian Space Research Organisation did not give out any further details about the launch. The Indian Space Research Organisation said that the 28 international satellites are from Spain, USA, Lithuania, and Switzerland. They are being launched under commercial agreements that were done with the space agency.